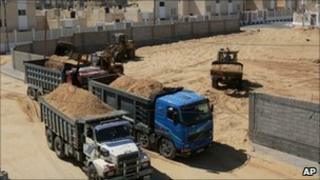 The UN says there has been "no material change" for people in Gaza since Israel announced it was "easing" its economic blockade of the Palestinian territory. In June Israel said it would lift some of its restrictions on Gaza to allow in more food and consumer goods. The move followed international pressure after the deaths of nine Turkish activists aboard a flotilla of ships trying to break the blockade. The head of UN operations in Gaza said few people had noticed any difference. "There's been no material change for the people on the ground here in terms of their status, the aid dependency, the absence of any recovery or reconstruction, no economy," the UN's John Ging told the BBC. "The easing, at it was described, has been nothing more than a political easing of the pressure on Israel and Egypt." There are now more Israeli products allowed into Gaza. But virtually all exports are still banned, which has devastated Gaza's economy. And the blockade on people remains. It is still extremely difficult for Palestinians to get Israeli permission to leave Gaza. Mr Ging accused Israel of ignoring demands from the international community to lift the blockade. A spokesman for the Israeli foreign ministry said the UN was missing the point. "The UN refuses to talk about the elephant in the room," said Yigal Palmor. "Why are there any problems in exporting and sometimes importing goods into Gaza? Why is the border blockaded? Because the territory has been overtaken by a declared terror movement." The blockade was originally tightened in 2007 after the Islamist movement Hamas came to power in Gaza. Israel as well as the US and the European union regard Hamas as a terrorist organisation.